Egypt's prosecutor-General Nabil Sadek announced on Friday night that the death toll in the IED attack on a bus carrying Vietnamese tourists in Giza earlier in the day has risen to four - three Vietnamese and one Egyptian fatalities. Sadek added that the number of injured stands at 11. Early on Friday evening, an IED detonated as a tourist bus traveling on El-Maryoutiya Street in Haram district, Giza, with 14 Vietnamese tourists and two Egyptian tourism workers on board. Shortly after the deadly explosion, Egypt's Interior Ministry issued a statement saying that the explosion took place on 6:15 PM, killing two vietnamese tourists and injuring 10, in addition to injuring their Egyptian bus driver and the representative of the tour company. All the injuried were immediately transported to the El-Haram hospital. The interior ministry said that security services immediately dispatched to the site of the explosion to carry out investigations. 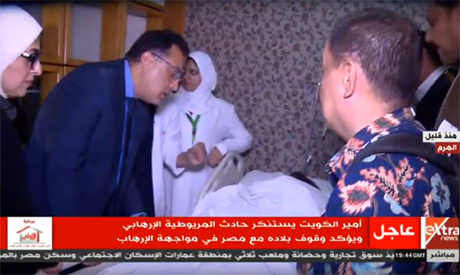 Also shortly following the explosion, Prime Minister Mostafa Madbouly headed to the hospital to visit the injured, and directed doctors to provide all necessary medical care. Minister of Health Hala Zayed had been monitoring the treatment and surgeries for the injured at the hospital. Minister of Tourism Rania Al-Mashat also visited the hospital to follow up on the status of the injured. Prime Minister Madbouly told reporters that all tourstim trips and their routes are highly secured in a detailed manner by the interior ministry. Madbouly explained, however, that the bus carrying the Vietnamese tourists deviated from the pre-determined, secured route without apriori notifying security officials. "I just want to highlight that following the incident, all state bodies swiftly moved to help secure the tourists and offer the necessary care," Madbouly told reporters. Madbouly said the Egyptian authorities has been in contact with the embassy of Vietnam in Cairo. He said that 20 ambulances were immediately dispatched to the site of the explosion. The Prime Minister had said that the death toll stood at two vitnamese toursits and the Egyptian representative of the tour company, with two of 10 injuried remaining in critical condition. The Egyptian PM also highlighted that Egyptian President Abdel-Fattah El-Sisi is closely following up on the incident. Madbouly pointed out that terrorism is a global phenomenon facing all countries, stressing that security forces in Egypt are taking the most necessary measures to combat the phenomenon, including strong pre-emptive strikes directed against terrorist spots. The Egyptian Prime Minister added that "such sinful incident' [like tonight's] does not diminish the efforts of the state in protecting tourists in the country." Shortly after the attack, Egypt's Prosecutor-General Nabil Sadek ordered an urgent investigation into the deadly explosion. The Prosecutor-General tasked the Supreme State Security Prosecution and the Southern Giza Prosecution with conducting the necessary inspection of the explosion scene and interviews of eye witnesses and survivors. Sadek also ordered the completion of an urgent autopsy report for those killed. He also ordered prosecutors to conduct forensic investigations to determine the nature of the material used to make the IED, and to impound all surveillance cameras in the vicinity of the explosion.